Dixie III's Story . . .
Update 02/16/2013: "Dixie moved to a foster home that has more experience working with shadow chasing." 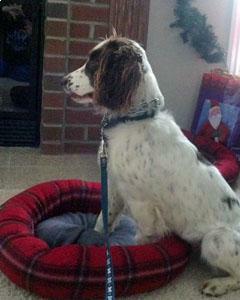 Dixie moved to a foster home that has more experience working with shadow chasing. Her new foster mom thinks she is a wonderful, loving girl! It’s obvious that the medication she’s taking is beneficial, because her shadow chasing has decreased by about 65%.........and it is getting better every day. It is believed that Dixie's shadow chasing started when she was penned outside with nothing else to do. To relieve her anxiety and to have some fun, she started chasing shadows. The medication is reducing the anxiety, as well, and her foster family is showing her other ways to have fun. Dixie will need to be maintained on this medication for at least a year to give her time to totally change her behavior. A visit to the vet determined that Dixie had a urinary tract infection. Now that she has been on medication for that, accidents have become a thing of the past. Dixie has learned that it is wonderful to sleep with her foster parents in the big bed. Sleeping with them has really helped her calm down and get a great night’s sleep! This petite, sweet girl is nothing but love and fun. Some very lucky family is going to have a great time with her! Update 01/31/2013: "The medication that Dixie has been taking to assist with her shadow chasing is definitely helping." The medication that Dixie has been taking to assist with her shadow chasing is definitely helping. Her foster mom has noticed that Dixie is becoming more interested in her humans and what they are doing. Hopefully she’s beginning to realize that there are so many more exciting things to do and see in life, beyond chasing shadows! Housetraining is still a work in progress for Dixie. She gets very distracted and forgets to request a potty break. With the overall change in her behavior, this should improve. In fact, her foster mom says that Dixie is an extremely sweet pup that will make a terrific family pet in her own time. As is typical with most adolescent springers, Dixie’s forever family will need a fenced yard for her to run around in or be willing to take her on long walks. She’s a young girl with a lot of energy and needs some good exercise to help get her wiggles out. Watch for news on Dixie’s progress. Once she meets her forever family, she’ll become THEIR special shadow! Original: "Dixie is a sweetie who is good with the resident dogs, cats, and kids in her foster home." After she was found as a stray in Ohio and taken to a shelter, MAESSR found out about Dixie’s plight and took her into its care. Dixie is a sweetie who is good with the resident dogs, cats, and kids in her foster home. The four year old child occasionally gets knocked over when Dixie jumps up to greet her. So, if there are children in her forever home, it may be better if the kids were older and better able to stay upright if a dog forgets to keep four on the floor. There is still some of the puppy in Dixie as she can be a bit mouthy without really nibbling on her people. A real lover of attention, she will lie on your lap or play with a toy with you—as long as there are no shadows present since she is a shadow chaser. Dixie ’s vet has started her on medication to help curb this obsession. Dixie ’s forever family will have to make sure she gets a lot of one-on-one interaction to help her overcome her fascination with shadows. 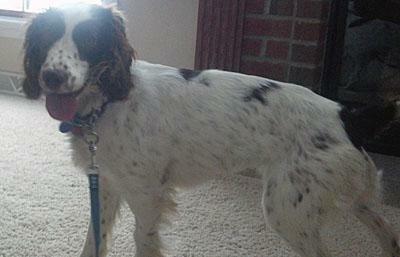 Housetraining is a work in progress for Dixie . Sometimes she asks to go out, but she still has occasional accidents inside. Her foster family’s regular schedule of taking Dixie out after eating, playing, and sleeping will get her on the track soon. Dixie is crate trained and spends the night crated without crying or whining. Good girl! When her foster family is out of the house, she is kept in an enclosed area within the house. Dixie ’s other house manners are good. She has never counter-surfed, gotten into the trash, gotten onto the furniture, or chewed on anything inappropriate—just on doggie toys and bones. Someone in her past had taught her to “speak” and to “sit” although she doesn’t stay still long! When she is sitting, her tail is still going 100 mph! So cute! She is obviously pleased with herself and happy to be pleasing her people! Since Dixie often pulls on leash walks, her foster family is using a training collar on her which definitely has helped; she rarely pulls when wearing it. 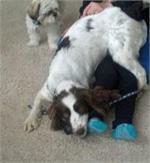 Additional obedience training would be excellent for Dixie when she arrives in her forever home. That will help her bond with her new family, learn to focus more, and to become a safe, well-trained Springer that will be a beloved addition to her family. 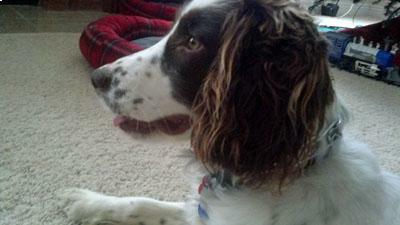 This young Springer is a very high energy girl who will play fetch with you when you can redirect her shadow chasing. A recent visit from another young, playful dog was a successful diversion for Dixie and she played nicely with the pup. As her medication kicks in and as she gets more one-on-one attention with her foster family, her attraction to chasing shadows will hopefully dissipate. Watch for more on this Dixie darling!